The lighter the shading, the less corrupt the state. Here’s a dry-as-dust academic article that basically says that the ten most corrupt states in the US spent about $1300 per state resident more in government monies each year, perhaps as a result of that corruption. It is unsurprising that corrupt states overspend public money. And, of course, we’d all probably prefer to live in an ‘honest’ state. There’s one reason in particular why we feel that honest states are important for us as preppers – if/when we have a major Level 2/3 situation occur, we suggest that the more honest the state, the (slightly) less likely there will be an orchestrated public taking of private property (ie of our supplies) and the greater the respect for pre-existing rules of law and private property rights. A huge problem is how do you measure corruption? Endemic corruption usually occurs in regions where laws are poorly enforced, and where courts are unlikely to impose severe punishments. This report measures a wide array of convicted crimes by officials : accepting bribes, awarding government contracts to vendors without competitive bidding, accepting kickbacks from private entities engaged in or pursuing business with the government, overstating travel expenses or hours worked, selling information on criminal histories and law enforcement information to private companies, mail fraud, using government credit cards for personal purchases, sexual misconduct, falsifying official documents, theft of government computer equipment for an international computer piracy group, extortion, robbery, and soliciting bribes by police officers, possession with intent to distribute narcotics, and smuggling illegal aliens. We can only guess if the levels of convictions matches the underlying level of actual active corruption. But, if we assume there is at least some weak correlation between the two, it is interesting to see how the states match up. Unfortunately, although the article ranks the states from least to most corrupt, it provides no data as to how much difference in perceived corruption levels there is between the most and least corrupt states. It also makes no attempt to get more finely focused than state-wide data. If you think of some states, there may be some corrupt big cities and also some stalwartly honest smaller towns and rural counties. Data has been obtained from convictions between 1976 – 2008. So, use this data with a grain of salt. 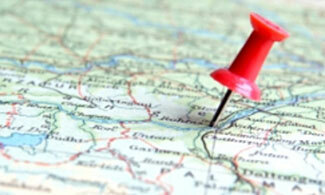 But, as always, it provides another small hint as to better and worse places to choose to base your future retreat. It is interesting to see the major difference in rating between Idaho (a good rating of 13th) and adjoining Montana, with a disappointing placing of 33rd. But, and as we said before, these numbers are dubious rather than definite. A freestanding device such as this allows you to conveniently convert any regular toilet for use by someone with mobility impairments. When we consider living at our retreat after TEOTWAWKI, we probably have a semi-heroic vision of ourselves and our fellow community members acting as modern-day Robinson Crusoes, struggling – successfully – against the various problems we expectedly and unexpectedly encounter in the very changed world that we suddenly find ourselves in. Let’s hope that’s the way things happen. But we must also realize that there’s every good chance that this vision is likely to be subject to some major changes due to all manner of unexpected and semi-random events, and the key part of being a prudent prepper is to try and identify and anticipate as many of these unexpected events as possible, and to have solutions in place for them. I’ve just now had such an event occur personally, and so am sharing the lessons I’m now learning at considerable cost and inconvenience with you in the hope your own future won’t be as impacted as mine has been. I’ve lived for over half a century. During that time, each ski season, and occasionally at other times of year too, I’ve seen people in various casts and other devices, clearly recovering from various sprained/fractured/broken bones. And, of course, from time to time, I see people in wheelchairs too. But – and I’m embarrassed to make this confession – I’d never really ever expected such a misfortune to happen to me. The how and why of it doesn’t matter, but suffice it to say that I now find myself massively ‘mobility impaired’ and expect to remain that way for an extended time into the future. It has been an interesting experience at every step along the way, and I’ve been wondering as to how many of the issues and needs experienced could/would be handled in the future, right from the first step of calling 911 from my cell phone and having seven paramedics attend (okay, so they probably could have managed with three or four, but it demonstrated, yet again, why you need your retreat to be part of a broader community of like-minded folk who you can turn to when needed in emergencies such as this). I’m also wondering how any future medical center can operate without an X-ray machine. That’s a topic for another time, but yes, you can buy used X-ray machines on eBay! The chances of members of your retreat community experiencing all manner of different injuries is much greater than you might expect. WTSHTF, you’ll all find yourselves suddenly in a somewhat unfamiliar environment, and for many of you, your life which prior to then may have been fairly sedentary and ‘safe’ will now involve much greater degrees of exercise and physical stress, creating lots of unexpected nasty ways for accidents to happen. Note also that accidents need not involve machinery and such awful things as attacking yourself with a runaway chainsaw. Accidents can also happen from simple things like slipping/falling on an icy pathway, or doing something else which on the face of it seems totally safe and commonplace, but which ends up going unexpectedly wrong (and when you’re physically fatigued, the chances of all such misadventures greatly increase). Falling off a bicycle (or horse), or possibly combat wounds of any and all types – whatever it might be, there are an abundant series of ways in which your life could suddenly change. Indeed, at present, in our ‘normal’ world, one out of three adults over the age of 65 experiences a fall each year, and falls are the leading cause of injury to people in this age group. The point of this article is to urge you to design your retreat structure and immediately surrounding exterior access-ways so as to be convenient for people who are or who may become disabled in some form or another. Fortunately, the basics of this can be covered simply and with little hassle, particularly if in the planning stages of your retreat. The key requirements are to have a living area that has no steps in any part of it, a bathroom that is also disabled friendly, and dimensions for doorways and corridors that allow for wheelchair access. Maybe you have a multi-level retreat structure (indeed, we recommend you should) but you need to ensure that a person can reasonably live for an extended time while only on one level. At its most simplistic, that means having a bathroom on every level, and some space that can do duty as a living/sleeping area. This is particularly valuable on the lowest level, making it easiest for any injured person to enter and exit the retreat, either for the purpose of visiting nearby healthcare services or in the case of any sort of emergency. One more thought about location. The chances are your retreat will not have a lot of spare manpower, and so you might want to think about the type of tasks that people suffering various forms of injury and mobility impairment can conduct, and design/locate such task spaces to make them conveniently accessible as a result. Outside your retreat, if you have steps leading up/down to your entry-way, you should either supplement them with a ramp or alternatively, have hand rails – ideally on both sides of the steps. Maybe you don’t want the handrails as permanent fixtures, but at least have mounting points for posts and rails to be added if/when the need arises. Maybe you’re the kind of person who bounds up half a dozen flights of stairs, taking them two at a time, and not needing to pause to catch your breath at the top. Maybe instead, you take stairs easily and slowly, and can manage to go between floors but with a certain amount of exertion and exhaustion. But no matter how hard you find it to go up or down a typical 14/15 step flight of stairs, you have no inkling of how difficult even a one inch rise becomes to the mobility impaired. Yes, read that again and remember it. Even a one inch rise becomes an appreciable barrier to someone in a wheelchair, and much more than two or three inches becomes a challenge for a person using a walker or crutches. You need to have a core part of your retreat with no rises/falls at all. One more thing about stairs. Make sure all stairs have handrails, ideally on both sides. In addition – and this is something you’ll only appreciate when you’re trying to struggle up them on one leg and crutches – it is very helpful to have extensions on the handrails beyond the top of each flight of stairs, so a person climbing up the stairs can still reach forward for support, even when about to go from the last stair in the flight to the landing beyond. A typical wheelchair is specified as being 26″ wide, but there are of course variations, and while you’ll not have problems with fitting narrower wheelchairs into wider spaces, if for some reason you end up with a wider chair, then you may be creating more issues than the extra width is worth to you. It is ‘good practice’ to look for doorway openings of at least 32″ to accommodate a wheelchair that is able to go directly through the door, and 36″ wide if the wheelchair has to do some turning or go through on an angle. Many interior doors are 30″ wide, and that’s okay in a pinch, but in such cases, be careful of what the true net width of the doorway is. If the door itself can not fully swing almost 180 degrees, then the width of the door will reduce the effective width of the door frame, and if there is any type of fascia/strip around the door frame, that might narrow down the actual effective width too. Strangely, it is far from uncommon to see bathrooms with narrower doorways, often only 24″ wide. You clearly can’t fit a 26″ wide wheelchair through a 24″ doorway and will need to remodel at least one bathroom for a wider entrance. Frame walkers will generally not exceed 24″ in width, but sometimes you might need to swap the wheels from being on the outside of the legs to the inside to get them to conform to that width. Generally the broader/wider the walker base, the more stable it is, so only do this if necessary. In confined rooms (again, most commonly bathrooms) the swept area the door covers as it swings open and shut might be a concern as well. Make sure the door can be opened and closed by a wheelchair-bound person, and that they can move around the room as needed while the door is opening and closing. If you are designing wheelchair ramps, you should probably build them out of concrete, because this gives you simultaneously the most permanent and long-lasting material and also one with good non-slip properties. Wooden ramps would likely be short-lived, higher maintenance, and slippery when wet. The official ADA specification for wheelchair ramps (which does not apply to private dwellings) is for a slope/rise of no more than one inch per foot of length (ie 1:12) and a maximum length before a rest/level area of 30 ft. You could use a slightly steeper rise if you needed to, up to as much as 2:12, particularly if the person in the wheelchair can be sure to have someone assisting them. A standard wheelchair is 42″ long from the back of the rear wheels to the front of the footrests, and you should allow another 6″ or so in front of that for your full foot. Lap height is about 27″ and the arms are at about 30″, while the seat is 19″. Much of your dwelling can ignore accessibility issues if necessary, as long as you realize that doing so may make such areas into ‘no go’ areas when/while a person becomes mobility impaired. An example of such optional areas could be the laundry room, storage and utility rooms, and even functional rooms such as kitchens (as long as there are other people to do the cooking). But one room that will be essential is a bathroom/toilet. You can design toilets right from the get-go to be accessible, which basically means giving them a higher seat height and support rails alongside, but there’s another approach that might also be worth considering – getting a toilet seat on a frame that stands around/over a normal toilet and which can be positioned in place as, when and if needed. 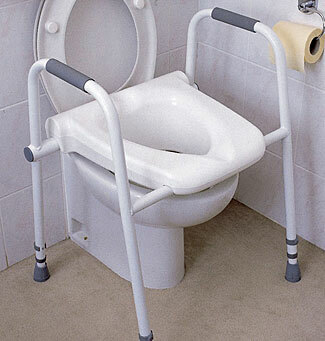 This can also be a dual purpose device that can be a portable commode as well as a toilet seat extender. Amazon have plenty to choose from; indeed, I’ve been using Amazon as a primary supplier for much/most of the various things I’ve needed during my present situation. Amazingly, some seemingly very common medical supplies have proven either to be totally unavailable locally or else stocked only in such limited supply (and great cost) as to be impractical, whereas Amazon and their two-day delivery has reliably arranged for bulk supplies of everything I’ve needed. If/when the person’s injury allows them to shower, a walk-in/wheel-in shower is a wonderful thing, or, failing that, some type of shower seat would be necessary for them to sit on. Needless to say, you’ll want all bathroom surfaces to be as non-slip as possible, particularly when wet either with water or condensation. Small bathrooms are better than big ones, because you can put support rails all the way around and the affected person is therefore always close to solid stable support as they move around the room. Talking about bulk supplies, the chances are your first aid kit has all the ‘usual stuff’ in it, but how much of such things do you actually have? Maybe you have a dozen gauze bandages, maybe more. To put things in context, during the course of three weeks I used up 168 rolls of gauze, each measuring 4″ wide by 4 yards long – that’s over 1/3 of a mile of 4″ gauze, for dressing a single set of wounds. I’m sure that I could have made do with less, but go count your rolls of gauze in your medical supply lockers and the chances are you’ll appreciate that whatever supply you have will become inadequate after only one or two unfortunate events. Oh yes, and in among the rest of your meds, do you have a generous supply of laxatives? Not a ‘nice’ topic to talk about, but an essential one for someone who becomes practically bed-bound, and all the more so with many of the likely meds they might be taking having a strong constipative side effect. Currently, our strong recommendation is for Mira-lax or a generic equivalent. We’ll spare you the details, but trust us. It works much better than many of the sennosides based products. Do you also have a pair of crutches in your medical locker? A walker? A wheelchair? Other assistive devices and mobility aids? The good news is that a lot of this type of gear is remarkably inexpensive when purchased from Craigslist or local charities who recycle such things. Even a reasonable wheelchair can be yours for perhaps as little as $50. On the other hand, brand new gear on Amazon is also often very affordable – for example, not only the commodes mentioned above, but pairs of crutches for under $30, and at those sorts of price points, maybe it is better to get new rather than used. You know that new gear is reasonably sterile, and you know that it still has a decent amount of life and use ahead of it, whereas some second-hand gear such as walkers get increasingly wobbly and less secure, the more they are used. Depending on where and how you expect your community members to live while afflicted with a disability (and with reduced access to any type of medical care, disabilities are not only more likely, but are also likely to be more impactful and longer lasting) you might need to add extra things such as grab rails in strategic locations around showers and beds, and perhaps it might be best to keep an inventory of such things uninstalled, and then add them to locations as may be indicated. Ummm – do we need to point out that towel rails are not load bearing structures and will rip out of the wall with only a very slight amount of force being placed on them. Talking about such things, there are also devices such as transfer boards to make it easier to move from one thing to another, and Hoyer lifts to help people get in and out of bed. A further word of advice. Some of these things are of course manufactured to different weight limits. Maybe no-one in your retreat weighs over 200 lbs, so you think you’ll never need anything with a weight capacity over 250lbs? Not necessarily so. We know people who have put on well over 100 lbs of extra weight as a result of an extended period of forced inactivity. This is also a further reason to buy new rather than used. You have no knowledge of the history of anything you buy used, and for all you know, it may have been massively overstressed in the past and be about to fail after only a slight amount of very gentle additional use. Some people plan for an uncertain future as if it will be little more than a slightly fun adventure. The reality is and will be much grimmer, and in some form or another, there is a dismayingly high probability that some members of your community will experience injuries that will impair their mobility, possibly for extended time periods, and which will require assistive devices and appropriate design of your retreat. Plan for it now so you’ll be prepared for it when it happens. Another tool in your retreat site selection process. Most of us have a preconceived view that some states are ‘better’ than others and more suitable for people wishing to experience a prepared lifestyle. The American Redoubt region in particular seems to be considered by many as an ideal region, but that contains a handful of states and many counties and regions. Here’s a rather simplistic webpage that allows you to answer seven questions with yes/no/not applicable as answers, and to select a possible state you are considering living within. From that limited data, it then reports the five towns which have their population believed to most closely match your own opinions. The information comes from, ironically enough, a company that specializes in helping Democratic causes and campaigns. Needless to say, there’s a great deal more to consider than the seven yes/no/don’t care questions asked by this program, but it is interesting to see where the resulting clusters of people ‘most like you’ end up being located within your preferred states. For example, we’d have expected our answers to suggest moving to northern Idaho but the townships returned were all in southern Idaho. In Montana, there was a preference for eastern Montana whereas we’d otherwise look to north/western Montana. There’s of course another use for this web page/mapping. Put in the opposite answers and see the places in your preferred state you might wish to avoid!